Wetlands are low-lying ecosystems that are saturated with water at or close to the surface. (An ecosystem consists of all the animals, plants, and microorganisms that make up a particular community living in a certain environment.) The most common types of wetlands are swamps, marshes, and bogs. Wetlands provide habitats for an incredibly wide variety of plants and animals. They also are important because they absorb heavy rainfalls and prevent flooding. In addition, wetlands protect the ground water humans depend on for drinking by capturing and neutralizing surface pollutants. However, wetlands are rapidly disappearing because they are being drained and filled for farming and urban growth. Wetlands also are being destroyed by pollution, especially the runoff of agricultural fertilizers and sewage dumping. tupelo, and eastern white cedar. More northern temperate swamps are usually dominated by red maple, silver maple, American elm, and green or swamp ash. Swamps provide a habitat for numerous species of animals. For example, swamps of bald cypress provide dwelling for the pileated woodpecker, red-shouldered hawk, Carolina wren, and many other small birds. These swamps also provide a nesting habitat for colonies of wading birds such as herons and egrets. Mammals supported by cypress swamps include swamp rabbits, white-tailed deer, and panthers. Many species of amphibians and reptiles—including the American alligator—live in cypress swamps. Marshes are large wetlands dominated by rushes, sedges, and low-lying grasses. Typical plants of North American marshes include cattails, reeds, bulrushes, and saw-grass. Marshes can support relatively large populations of birds and certain mammals such as muskrats. Relatively small, fringing marshes around lakes and ponds are common in the prairies of North America. The borders of these marshy areas, called potholes, have historically provided major breeding habitats for surface-feeding ducks such as mallards, pintails, and blue-winged teals. Biodiversity: Existence of a variety of plant and animal species in an ecosystem. Ecosystem: The collection of plants, animals, and microorganisms in an area considered together with their environment. Peat: Soil composed chiefly of decaying plant matter. Primary succession: Natural replacement over time of one plant community with another more complex one. Bogs are areas of wet spongy ground composed chiefly of peat (soil composed chiefly of decaying plant matter). The water underneath the surface-floating peat contains very little oxygen and other nutrients. It is also very acidic. As a result, bogs are dominated by acid-loving vegetation such as sphagnums (an order of mosses), sedges, and heaths. 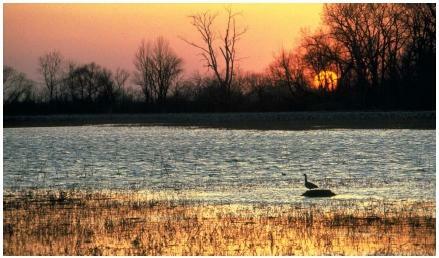 Wetlands are dynamic ecosystems that are in transition between land and water habitats. Over time, most wetlands gradually fill in, a natural process known as primary succession. All wetlands were originally lakes or other bodies of water. Tons of plants, animals, and insects grow and die each year. The decaying material from these organisms gradually accumulates in small lakes. After a while, the lake becomes a wetland. The process continues with the wetland filling in more and more. Eventually, the wetland becomes a meadow, which in turn becomes a forest. Wetlands also are delicate ecosystems. The biodiversity (the existence of a variety of plant and animal species in an ecosystem) of a particular wetland is maintained by the conditions that exist in that wetland. The plants and animals that thrive in a specific wetland have done so by adapting to the soil, water, nutrient supply, and other conditions found there. In general, wetlands that are well supplied with phosphorus (in the form of phosphate) and to a lesser degree nitrogen (as nitrate or ammonium) sustain relatively large populations of plants and animals. This is commonly the case for marshes, which are among the most productive natural ecosystems on Earth. In contrast, wetlands with low supplies of nutrients, such as bogs, sustain only small populations of plants and animals. All wetlands have great value as natural ecosystems, and they all support species of plants and animals that occur nowhere else. Their usefulness in providing essential habitat for fish, birds, and other wildlife cannot be overstated. Similarly, humans gain from wetlands, which control floods and erosion, cleanse the water that flows through them, and extend supplies of water for drinking or irrigation. In addition, wetlands have an aesthetic (beauty) value that is priceless. Unfortunately, most of the world's wetlands are being lost rapidly. Land developers drain and fill them in. Since the beginning of European settlement in America, more than 65 million acres have been lost. Often, wetlands are used for the disposal of municipal solid wastes and sewage. Run-offs of chemical pollutants from farmland further pollute wetlands, disturbing their delicate soil-water balance and endangering their many plant and animal species. we very much appreciate this article because it is helping with our project! Thanks for the information, Wetlands are very interesting, we originally wanted Coral Reefs, but I think I like wetlands better. Because we live near a lot of them. Thanks a bunch! Great job creating this essay! I never knew wetlands played such a huge part of our ecosystem! thanks for the info i really enjoyed this site! it was healpful for my project!!! this site is an amazing resource for my science project :) thanks a million.